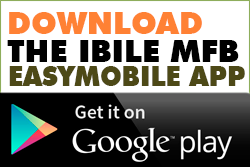 IBILE Mobile App for Internet Banking on the go on your mobile, it is available in Google Playstore. IBILE EasyMobile for all kinds of mobile phones. It’s easy to use and does not require the use of the internet. Simply dial *540*317# to start. IBILE Debit Card, we have the Verve and MasterCard variants. This Card is a secure Debit card that allows the flexibility of making Web and POS payments as well as ATM withdrawals across terminals within the country. This is a Banking service that allows IBILE MFB customers to access first class Banking services through the wide network coverage of our settlement Banks in Lagos State. This service allows our customers to make deposits and withdrawals over the counter through our settlement Banks. Cable Tv Bills, DSTv,GoTv; Startimes, Consat, iRoko TV, MyTV, etc. Utility bills: Eko Electric, etc. Telco Phone bills: MTN, Airtel, Glo, Etisalat. Internet services: Smile, Spectranet, Swift4G.iPNX.